Kansas City, Mo. 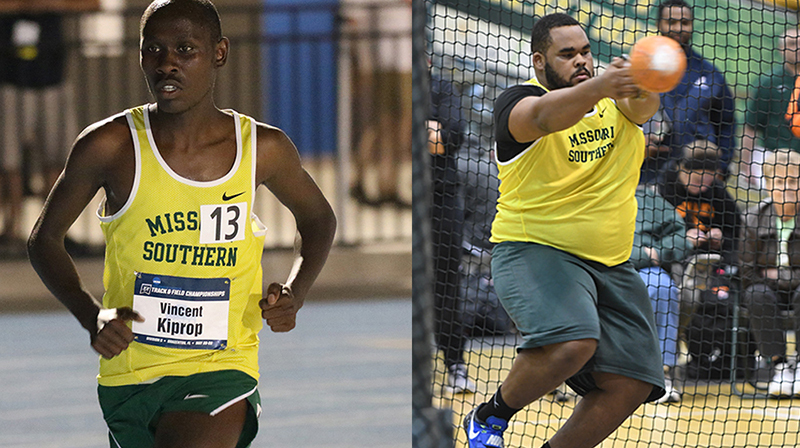 – For the second week in a row Missouri Southern swept the MIAA Men’s Track and Field Athlete of the Week honors with Vincent Kiprop winning on the track and Bryan Burns in the field. At Nebraska, sophomore Vincent Kiprop shattered the previous MSSU 5k record by 15 seconds as the sophomore won the event by more than a minute in a time of 13:53.94. The time is an NCAA automatic qualifying mark and is tops in Division II by nine seconds. The sophomore is a native of Kericho, Kenya where he competed at Londiani Boys High School. At Central Missouri, junior Bryan Burns broke the MSSU shot put record for the third time this year, this time nearly eclipsing 60 feet as he threw a provisional distance of 59-11.75 to win the event. The throw ranks second-best in the country this year in Division II and is tops in the MIAA by over a foot and a half. The junior is a native of Carthage, Mo. where he competed at Carthage High School.